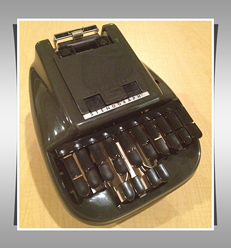 History of Writing Machines | Stenograph L.L.C. This machine had the first plastic shell (case) on a shorthand machine. The case was made from Cycolac, which at the time was a new, tough plastic. The plastic shell helped make the machine even more durable. It was available in charcoal, green, and sand colors. This was the first Stenograph machine to encode machine notes in computer language on a floppy disk - the profession's first true DOS-based machine. 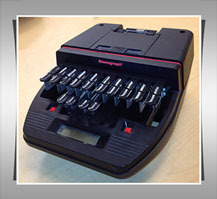 Code-named the Stenograph MS-DOS Advanced Real Time writer, it was introduced as the Smart Writer. 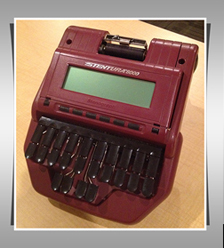 It was considered state-of-the-art until the Stentura Stenograph Machine was introduced in 1992. The Stentura was the first machine of its kind to feature instantaneous realtime translation of text with a Liquid Crystal Display (LCD) showing English or Steno. This machine was offered in contemporary colors: Onyx, Jade, and Royale. More than 50,000 Stenturas were sold to court reporters around the world, and many are still in use today. Introduced in 2001, the élan Cybra became the machine for transcriptionists, captioners, and CART reporters. A new Professional version was introduced in 2006 that included the addition of optional wireless and was designed for realtime transfer. The Cybra is paperless, inkless, ribbon-less, and greaseless, which made it a perfect machine for the specialized professions. 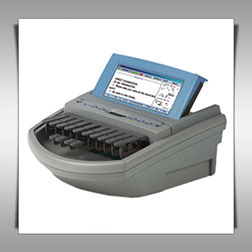 The completely paperless élan Mira was originally introduced in 2003. In 2004 the élan Mira G2 was introduced, which added the ability to flip the LCD (Liquid Crystal Display) screen upward for easier viewing. 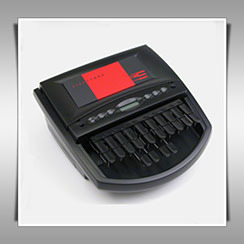 In 2005, Stenograph unveiled the élan Mira A3, which quickly became the standard in court reporting, featuring Audiosync® OTG - on the go!, a USB port for writing realtime, a DB9 serial port for use with wireless Bluetooth.